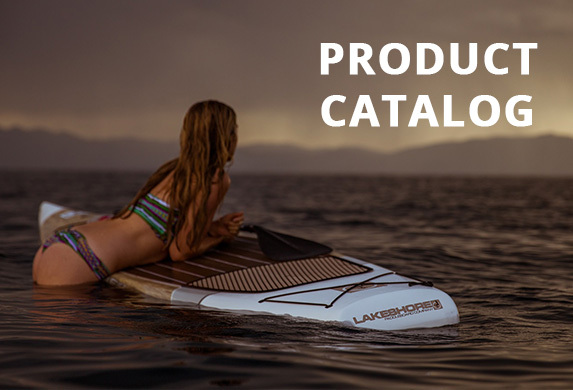 FAQ - Frequently Asked Questions - Lakeshore Paddleboard Co.
Lakeshore Paddleboard Co. has partnered with Affirm to offer payment plans as an option to pay for your purchase. It is basically a loan that allows you to make fixed monthly installments over your choice of 3, 6, or 12 months with rates anywhere from 10-30% APR depending on your credit score. Affirm is a consumer friendly financing alternative to credit cards that allows you to buy now and pay over time with no hidden fees. Their loans are underwritten by Cross River Bank, a New Jersey State Chartered Commercial Bank, Member FDIC. You can pre-qualify before making your purchase to get an estimate of how much you can borrow. Pre-qualifying only takes minutes and checking your eligibility will not affect your credit score. Just enter a few pieces of information for a real-time decision. Checkout is simple – just choose “Affirm Monthly Payments” as the payment method within the checkout process. Know upfront exactly what you’ll owe, with no hidden costs and no surprises. You will be presented with loan terms (amount, time frame, rate, and maximum interest) before making any decision and you never pay more than what you agree to upfront. The total at checkout will always be what you actually pay. 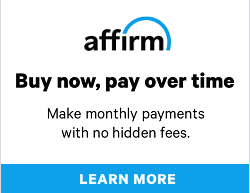 Affirm connects directly to our online store, so your account stays secure. Pick a loan that fits your budget. You’ll make real progress every month, and at the end of your loan you’re free and clear.